Philips Audio relaunches, budget true wireless earbuds incoming | What Hi-Fi? TP Vision, the manufacturer and marketer of Philips TVs, is ready to relaunch the Philips Audio brand in Europe this year, following its acquisition of the exclusive global rights for the design, marketing and sales last summer. Philips Audio will operate as a standalone business, but it will be part of the TP Vision operation at the European HQ in Amsterdam. 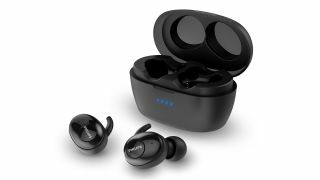 TP Vision says that while it had originally planned a ‘low-key’ start in 2019, it’s decided to re-introduce some of Philips Audio’s ‘most popular’ lines with immediate effect – one of which is a pair of budget true wireless earbuds. The SHB2505BKs (yes, the laborious naming of Philips audio products sadly remains) support Bluetooth 5.0 and offers a 12-hour battery life with a charging case – for only €99 (UK pricing tbc). In the first half of the year, TP Vision hopes to introduce a wide range of products within portable, wireless, smart and home audio categories under both the Philips Audio and the (largely successful) higher-end Philips Fidelio brand names. The company also plans to scatter launches throughout the year, with product reveals at IFA in September too.